3. Faith Shewn by Works: A Sermon on James 2:18. By Samuel Miller, D.D. 11. 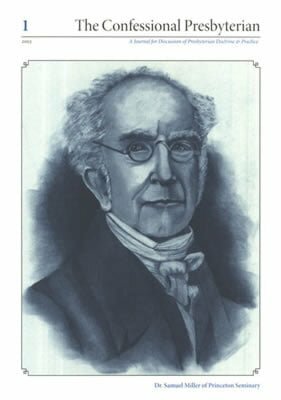 Samuel Miller, D. D. (1769-1850) An Annotated Bibliography. By Wayne Sparkman, M.A.R., M.Div. 65. Jonathan Edwards on Scripture & Salvation. By W. Gary Crampton, Ph.D.
94. The “Ministerial and Declarative” Powers of the Church and In Thesi Deliverances. By C. N. Willborn, Ph.D.
102. A Critical Examination of N. T. Wright’s Doctrine of Justification. By J. V. Fesko, Ph.D.
116. Reframing Presbyterian Worship: A Critical Survey of the Worship Views of John M. Frame and R. J. Gore. By Frank J. Smith, Ph.D., D. D. & David C. Lachman, Ph.D.
151. Reviews & Responses: Stephen Westerholm, Perspectives Old And New On Paul: The ‘Lutheran’ Paul And His Critics (Rowland S. Ward) ■ Leonard J. Coppes, The Divine Days of Creation (Benjamin Shaw) with Response (Leonard J. Coppes) and Reply (Benjamin Shaw) ■ Norman Shepherd: Law and Gospel in Covenantal Perspective (Wayne Forkner) ■ Robert Traill: Justification Vindicated (Andrew J. Webb) ■ The Auburn Avenue Theology, Pros and Cons: Debating the Federal Vision (J. Ligon Duncan III, Ph.D.). 166. In Translatiōne: Andrew Willet’s Preface to Nicholas Bownd’s Sabbathvm veteris et Novi Testamenti. 168. Antiquary: The Traditional Form of The Westminster Standards.